"Sparkling shoes for sparkling wine!" One of the first things I said to Celine Lannoye was "I love your shoes!" As I stood next to her, pointing at her feet with my mouth wide open (like the classy gal I am) she let out a contagious laugh and replied "Sparkling shoes for sparkling wine!" So, who is Celine Lannoye and why do her shoes sparkle? 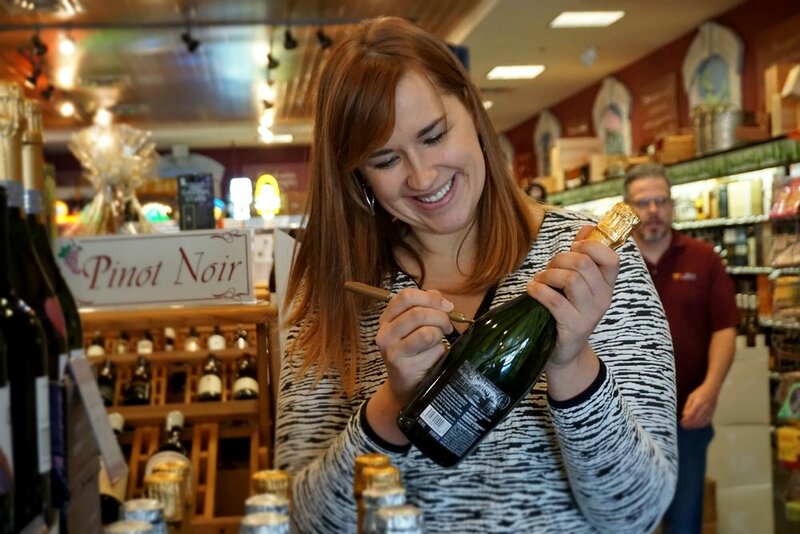 Well, she's an incredibly smart wine-lover turned wine-maker whose winery produced 1.3 million bottles of French sparkling last year, and she's barely 30 years old! At Wine World, we go way back with Celine--she traveled here from France and did an internship with us back in 2007! The Lannoye name has been making quite a splash in the wine world for a while now. You have probably either enjoyed one of their wines while noshing in The Wine Bar, or taken a bottle home from our retail stores; Vignobles Lannoye produces Bordeaux wines such as Chateau Lanbersac, Ambe Tour Pourret, & Moulin de Clotte. 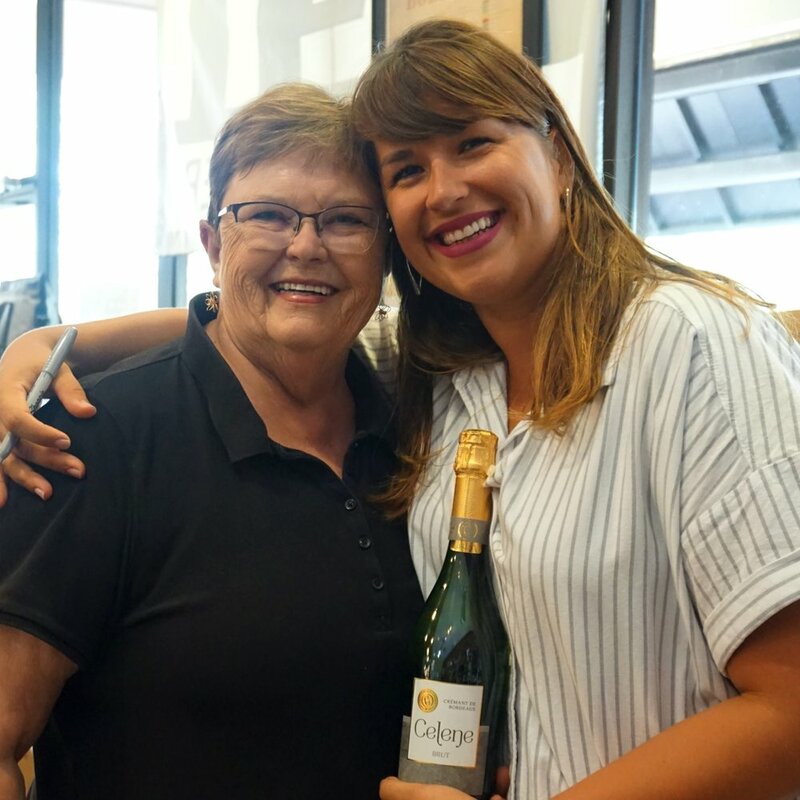 Winemaker, Francoise Lannoye, has a passion for wine that her daughter, Celine, has most certainly inherited! Living in her family's vineyards since she was a pre-teen, it's not surprising that Celine began co-managing some of the estates with her mother when she finished school. Being under 30 and running her very own winery? Now that's impressive! Célène Bordeaux was added to the Lannoye legacy just over two years ago. In 2007, a young Celine Lannoye studying at Kedge in Bordeaux, packed her bags and came to the United States to study at Wine World for a year. Right here in the heart of Destin, Celine learned key lessons in wine marketing and business management across cultures--not to mention the English language! Now, a little more than a decade later, she is the Director of her own successful winery, Célène Bordeaux. Here, at what was once the Maison Ballarin, she and her team produce Crémant de Bordeaux. These French sparkling wines are made using "methode traditionalle." Meaning? The exact same process is used as when champagne is made! Of course, these wines are made in Bordeaux--not Champagne, and they feature some different grape varieties than what you find in a champagne (Semillon, Colombard, Cabernet Franc, Merlot, and Muscadelle). (above) Celene Rose surrounded by other Lannoye family wines, all sporting Celine's signature. We had the pleasure of spending some time with Celine this week, as she visited from France for a few short days. Of course, we did the usual song and dance of bottle signing, photographs, and a great wine presentation, but I particularly enjoyed just chatting with Celine over pizza at The Wine Bar in Watercolor. We talked about all things bubbly, French and American cultures, and her history with Wine World. The story of Celine Lannoye's winemaking journey is interesting, yet far from over. It is exciting to know that our community has played an important role in it! (above) Celine graciously putting up with my paparazzi moves and signing some of her bottles for our customers! What is the #1 reason people should try Cremant over, say, Champagne? "It is the value! With Methode Traditionalle and Cremant, you are getting wine that is as good as and sometimes better Champagne, but it is a much lower price. People want to pay for the name Champagne, but you can save money and have something like this and you will not know the difference!" Okay, it's bugging me: Your name is Celine (spelled with an "i"), but your wines are labeled Celene (with an "e")...what's up with that? "It is actually a hybrid of my name and the name Silene, the god of drunkenness and wine-making in greek mythology." Célène Bordeaux is sold in markets around the world. Do you find that the American palate prefers more sweet or dry sparkling? "Actually, your tastes are very close to us in France! In other places like Asia, they prefer much sweeter. But Americans enjoy the Brut with only a little sugar, like the French." Back at Kedge in Bordeaux; did you study Oenology or Business Management? "I did not learn Oenology at school, Kedge was a business school. I learned everything I know about wine and Oenology in the field, living in my family winery." You started your internship in Destin at Wine World in 2007; Was that the first time you had ever visited the U.S.? "It was my very first time in the US. My first long international flight alone turned out to be a nightmare with delays, missed planes and lost luggage! Now I am used to it, but at that time, with the language barrier, it was scary! I can say that I felt overwhelmed during the 3 first months, but my stay in the U.S. was probably one of the best experiences in my life." What key lessons did you learn--did they turn out to be different from your original expectations? "First I had to learn English, it was not my forte at the time. I had to learn about the wine regions that I did not know (almost every country apart from France!) Michel [Thibault] was a great teacher in that. I also remember Chan [Cox] teaching me the principle of merchandising on some early mornings. [...] I think the main thing I learned is that you need to be proactive in everything you do. Sell wine does not only mean "sell wine." It means to welcome your consumers, make sure to give them the right advice, to have good products in your store with clear information on them, to keep everything tidy, but also to propose new products and concepts to keep your clients entertained! Wine, to me, is, first of all, a synonym of « sharing » whether you are a winemaker or a wine lover." How do you feel your time in the U.S. affected your outlook on winery management & marketing across different cultures? "It was a good experience to be everyday in contact of consumers, it helped me understand their needs. I think wine goes across culture. We don’t all have the same taste but we like it for the same reasons. Each time I launch a new wine I try to put myself in the consumer shoes and I ask my self some questions: What is different with this wine? For which occasion will I open it? What price am I willing to give to this bottle ? There are a lot of common preconceptions about wine (especially Bordeaux), I like to go over them." Any big plans for the future of Celene Bordeaux? "I always have plans but I mainly try to keep my eyes open to new opportunities."